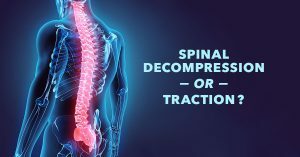 Spinal Spinal Decompression Vs. Traction: Is There a Difference? Is Spinal Decompression the Same as Traction? If you suffer from back pain, especially lower back pain, you might be confused about all of your treatment options. You wonder about surgery, but you may be concerned about its effectiveness, and worry about rehabilitation and medications you may have to take while you’re recuperating. You may be interested in chiropractic therapy at Total Chiropractic Care and Wellness because you’ve heard that chiropractic manipulation can help you manage pain and is a non-invasive alternative to surgery. You also may have heard about other techniques such as traction or spinal decompression and wonder what they’re about. Someone may even have told you that traction and spinal decompression are the same things. At Total Chiropractic, we want you to have all of the information out there about your health care options. So, we want to let you know all about spinal decompression and traction and explain how they are different. 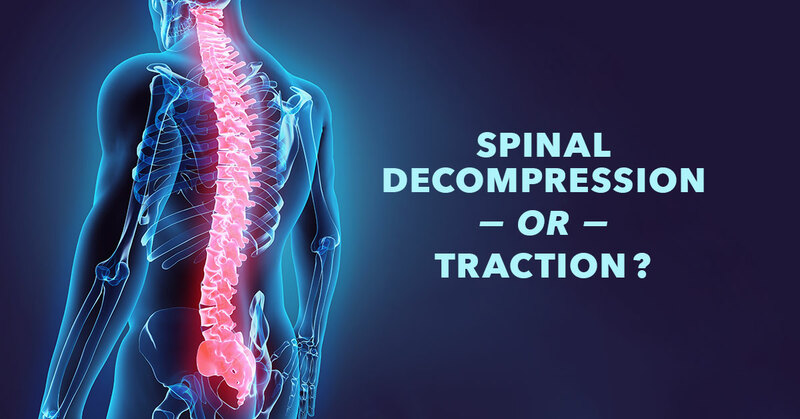 Traction Vs. Spinal Decompression: How Different Are They? In cases involving mechanical spinal traction a patient “will lie on a table that has special tools to stretch the spine. A physical therapist will attach a series of ropes, slings, and pulleys to your body to mechanically relieve pressure,” according to Healthline. When you come to Total Chiropractic for spinal decompression therapy, we will use a table that’s similar to traction tables but uses advanced technology. Patients are strapped to a decompression table that’s controlled by a computer program. The table moves and as it does, it will produce a distraction force to targeted areas of your spine. This will be flooded by a relaxation phase of your treatment and the result is that the system will create negative pressure which works like a vacuum effect. Writing in the Coeur d’Alene/Post Falls Press, Dr. Wayne Fitcher says, “The key difference between regular traction and spinal decompression therapy is the computer.” The program creates variations in the traction pull rather than simply pulling on the spine at a pre-set rate and force. The spinal decompression system can adapt to a patient’s body reaction and allows the patient to keep the body relaxed. This makes the treatment more effective than what can be achieved with regular traction. State-of-the-art technology makes spinal decompression an effective way to relieve back pain and it’s available to patients at Total Chiropractic Care and Wellness. We can help ease back pain, without resorting to surgery. Contact us today.